If you have a barcode scanner installed on your device, scan the code here to be taken directly to the Android WebControl download page. Don’t hesitate to contact me and tell me what you like or don’t. If you have any problems report it directly from your device using Menu->Report Bug and we’ll do the best to fix it. Keep Android WebControl ad free ! 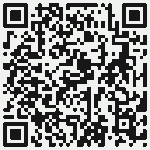 If you like Android WebControl and you want to buy me a beer just donate a few bucks I’ll appreciate it.